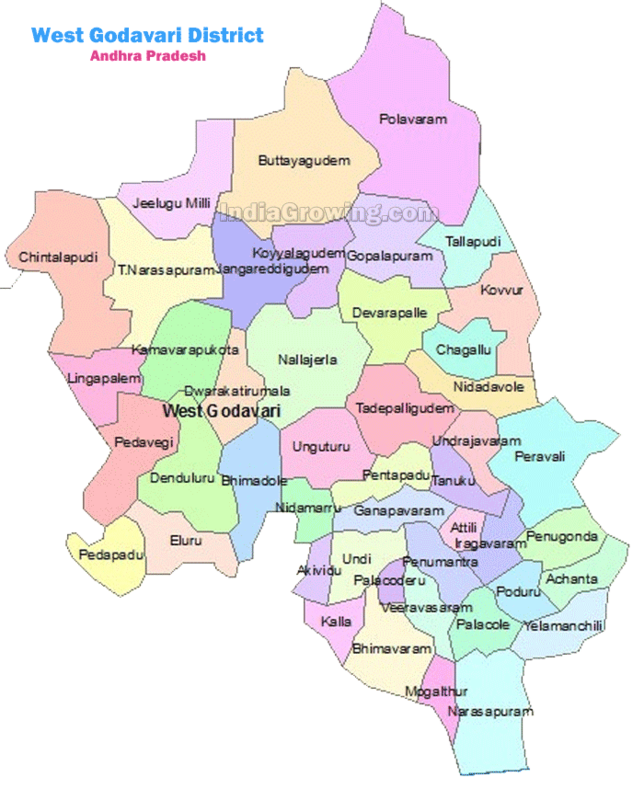 As per census West Godavari has a population of 3,936,966 in 2011 out of which 1,964,918 are male and 1,972,048 are female. Expected population of West Godavari in 2019 is between 4,370,033 and 5,118,056. Literate people are 2,652,389 out of 1,379,223 are male and 1,273,166 are female. People living in West Godavari depend on multiple skills, total workers are 1,773,112 out of which men are 1,199,338 and women are 573,774. Total 149,420 Cultivators are depended on agriculture farming out of 138,120 are cultivated by men and 11,300 are women. 888,815 people works in agricultural land as labor, men are 564,273 and 324,542 are women. The West Godavari average altitude (elevation) 0 to 10 meters above sealevel. plz upload the Every one voter ids in ward wise, who have an voter id cards, in recent days some cabdidates names are deleted so they are in confusion. Hello, I am prasad Neelam and I belongs to kaligotla. we don't have basic public transportation from our village. people has to go to Aredu (near by village) to get the public transport. Students and Elder people are facing a lot of problems because of this. Please look into it. yours sincerely, prasad. I am siva from yendagandi. I am very poor family .my dad is farmer we can do the field of rice . one acara of field give 3.75 tans of rice ,but nowadays prepare the aqua tanks . recently 500 acara prepare the tanks. transportationproblem. no bus facility.only auto from tallapudi to adpeta.rajahmundry to adpeta no busses onlyauto facility.it is too much.nobody can solve this problem.pl take neccessary steps to solve this problem. sir, i want mr dasari sampata rao home address . The problem is mainly about waste disposal. There is no proper dispose of waste. .v should aware people for its safe dispose separately.plastic waste increased a lot. .y this panchayat not taking care of land?vermi cultere n plastic recycling units must to get clean penugonda.Do programmes for cleaning tell people,clean draons safe our town from diseases. please announce the subsidy items (like pipes , tractor items) for the public in agriculture dept . please send an information from agriculture dept. thanking you sr.